4Easysoft DVD to Sansa Suite is the discount Sansa Converter, which packed with DVD to Sansa Converter and Sansa Video Converter. With this DVD/video to Sansa Converter, you can easy to convert any DVD and popular video file to Sansa supported MP4 and WMV video. Moreover, this DVD to Sansa Suite also can extract audio from DVD/video and convert between audio files. Powerful editing features enables you to further recreate your sansa video: trim, crop, merge, effect, watermark, etc. The DVD to Sansa Converter can help you convert DVD disc, DVD folder and IFO file to Sansa supported video formats like MP4 ,WMV, etc. and audio MP3, WMA, etc. 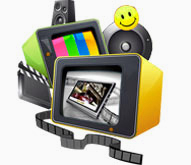 With the Sansa Video Converter, all popular video formats like MPEG, AVI, MOV, MKV, MTS, FLV, RM, etc. 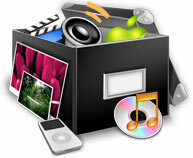 can be converted to sansa video and audio formats. Also it can convert audio files to Sansa. This professional DVD/video to Sansa Converter enables you to adjust the video brightness, contrast and saturation to optimize the video visual effect. 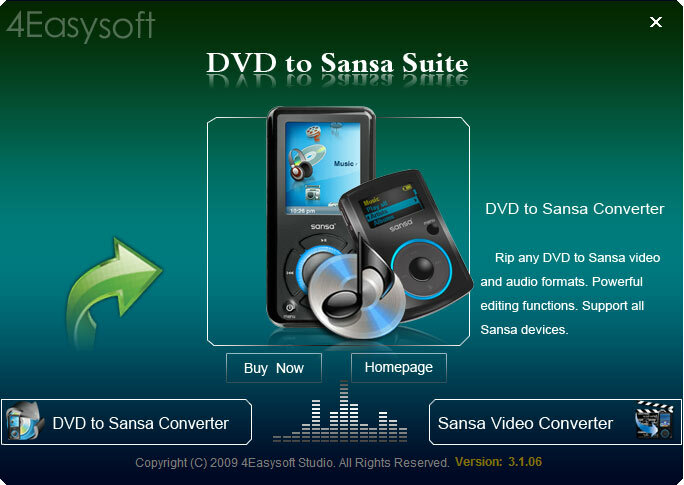 4Easysoft DVD to Sansa Suite allows you to convert part video from the source DVD/video. Also it enables you to merge several DVD or video chapters into one file for to play on Sansa. Remove the unwanted black edges and adjust the video aspect ratio and zoom mode to change the video play screen fit your Sansa player. 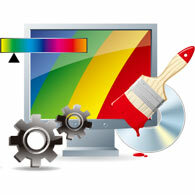 4Easysoft DVD to Sansa Suite owns the ability of adding text or picture watermark to Sansa video. The position and transparency is adjustable. With 4Easysoft DVD to Sansa Suite, you can choose your favorite audio track and subtitle. Or you can choose output Sansa video without subtitle. 4Easysoft DVD to Sansa Suite provides the powerful parameters like Video Encoder, Resolution, Frame Rate, Video Bitrate， Audio Encoder, Sample Rate, Channel and Audio Bitrate for you to choose for Sansa video. The built-in player can help you preview the source DVD/video and converted Sansa video. Meanwhile, you can take snapshot and save as JPEG, GIF, BMP. This Sansa package software provides you the intuitive interface, which is easy for even the beginners to convert DVD/video to Sansa player. With the professional kernel technology, 4Easysoft DVD to Sansa suite can assist you to convert DVD and video to Sansa formats with super fast speed and perfect quality. Free audio track and subtitle selection.